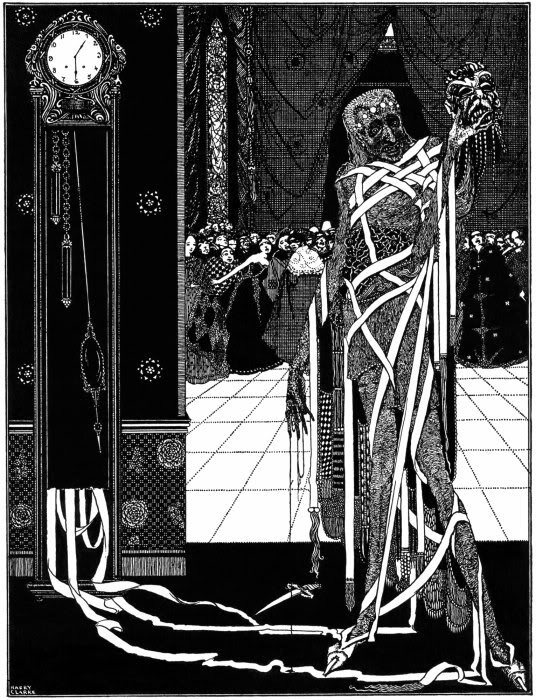 Illustration for Edgar Allan Poe's story "The Masque of the Red Death" by Harry Clarke (1889-1931), published in 1919. The red death had long devastated the country. No pestilence had ever been so fatal, or so hideous. Blood was its Avatar and its seal--the madness and the horror of blood. There were sharp pains, and sudden dizziness, and then profuse bleeding at the pores, with dissolution. The scarlet stains upon the body and especially upon the face of the victim, were the pest ban which shut him out from the aid and from the sympathy of his fellow-men. And the whole seizure, progress, and termination of the disease, were incidents of half an hour. They resolved to leave means neither of ingress nor egress to the sudden impulses of despair or of frenzy from within. The abbey was amply provisioned. With such precautions the courtiers might bid defiance to contagion. The external world could take care of itself. In the meantime it was folly to grieve or to think. The prince had provided all the appliances of pleasure. There were buffoons, there were improvisatori, there were ballet-dancers, there were musicians, there was Beauty, there was wine. All these and security were within. Without was the "Red Death." It was a voluptuous scene, that masquerade. But first let me tell of the rooms in which it was held. There were seven--an imperial suite, In many palaces, however, such suites form a long and straight vista, while the folding doors slide back nearly to the walls on either hand, so that the view of the whole extant is scarcely impeded. Here the case was very different; as might have been expected from the duke's love of the "bizarre." The apartments were so irregularly disposed that the vision embraced but little more than one at a time. There was a sharp turn at the right and left, in the middle of each wall, a tall and narrow Gothic window looked out upon a closed corridor of which pursued the windings of the suite. These windows were of stained glass whose color varied in accordance with the prevailing hue of the decorations of the chamber into which it opened. That at the eastern extremity was hung, for example, in blue--and vividly blue were its windows. The second chamber was purple in its ornaments and tapestries, and here the panes were purple. The third was green throughout, and so were the casements. The fourth was furnished and lighted with orange--the fifth with white--the sixth with violet. The seventh apartment was closely shrouded in black velvet tapestries that hung all over the ceiling and down the walls, falling in heavy folds upon a carpet of the same material and hue. But in this chamber only, the color of the windows failed to correspond with the decorations. The panes were scarlet--a deep blood color. Now in no one of any of the seven apartments was there any lamp or candelabrum, amid the profusion of golden ornaments that lay scattered to and fro and depended from the roof. There was no light of any kind emanating from lamp or candle within the suite of chambers. But in the corridors that followed the suite, there stood, opposite each window, a heavy tripod, bearing a brazier of fire, that projected its rays through the tinted glass and so glaringly lit the room. And thus were produced a multitude of gaudy and fantastic appearances. But in the western or back chamber the effect of the fire-light that streamed upon the dark hangings through the blood-tinted panes was ghastly in the extreme, and produced so wild a look upon the countenances of those who entered, that there were few of the company bold enough to set foot within its precincts at all. It was within this apartment, also, that there stood against the western wall, a gigantic clock of ebony. It pendulum swung to and fro with a dull, heavy, monotonous clang; and when the minute-hand made the circuit of the face, and the hour was to be stricken, there came from the brazen lungs of the clock a sound which was clear and loud and deep and exceedingly musical, but of so peculiar a note and emphasis that, at each lapse of an hour, the musicians of the orchestra were constrained to pause, momentarily, in their performance, to hearken to the sound; and thus the waltzers perforce ceased their evolutions; and there was a brief disconcert of the whole gay company; and while the chimes of the clock yet rang. it was observed that the giddiest grew pale, and the more aged and sedate passed their hands over their brows as if in confused revery or meditation. But when the echoes had fully ceased, a light laughter at once pervaded the assembly; the musicians looked at each other and smiled as if at their own nervousness and folly, and made whispering vows, each to the other, that the next chiming of the clock should produce in them no similar emotion; and then, after the lapse of sixty minutes (which embrace three thousand and six hundred seconds of Time that flies), there came yet another chiming of the clock, and then were the same disconcert and tremulousness and meditation as before. But, in spite of these things, it was a gay and magnificent revel. The tastes of the duke were peculiar. He had a fine eye for color and effects. He disregarded the "decora" of mere fashion. His plans were bold and fiery, and his conceptions glowed with barbaric lustre. There are some who would have thought him mad. His followers felt that he was not. It was necessary to hear and see and touch him to be _sure_ he was not. He had directed, in great part, the movable embellishments of the seven chambers, upon occasion of this great fete; and it was his own guiding taste which had given character to the masqueraders. Be sure they were grotesque. There were much glare and glitter and piquancy and phantasm--much of what has been seen in "Hernani." There were arabesque figures with unsuited limbs and appointments. There were delirious fancies such as the madman fashions. There were much of the beautiful, much of the wanton, much of the bizarre, something of the terrible, and not a little of that which might have excited disgust. To and fro in the seven chambers stalked, in fact, a multitude of dreams. And these the dreams--writhed in and about, taking hue from the rooms, and causing the wild music of the orchestra to seem as the echo of their steps. And, anon, there strikes the ebony clock which stands in the hall of the velvet. And then, for a moment, all is still, and all is silent save the voice of the clock. The dreams are stiff-frozen as they stand. But the echoes of the chime die away--they have endured but an instant--and a light half-subdued laughter floats after them as they depart. And now the music swells, and the dreams live, and writhe to and fro more merrily than ever, taking hue from the many-tinted windows through which stream the rays of the tripods. But to the chamber which lies most westwardly of the seven there are now none of the maskers who venture, for the night is waning away; and there flows a ruddier light through the blood-colored panes; and the blackness of the sable drapery appalls; and to him whose foot falls on the sable carpet, there comes from the near clock of ebony a muffled peal more solemnly emphatic than any which reaches _their_ ears who indulge in the more remote gaieties of the other apartments. In an assembly of phantasms such as I have painted, it may well be supposed that no ordinary appearance could have excited such sensation. In truth the masquerade license of the night was nearly unlimited; but the figure in question had out-Heroded Herod, and gone beyond the bounds of even the prince's indefinite decorum. There are chords in the hearts of the most reckless which cannot be touched without emotion. Even with the utterly lost, to whom life and death are equally jests, there are matters of which no jest can be made. The whole company, indeed, seemed now deeply to feel that in the costume and bearing of the stranger neither wit nor propriety existed. The figure was tall and gaunt, and shrouded from head to foot in the habiliments of the grave. The mask which concealed the visage was made so nearly to resemble the countenance of a stiffened corpse that the closest scrutiny must have difficulty in detecting the cheat. And yet all this might have been endured, if not approved, by the mad revellers around. But the mummer had gone so far as to assume the type of the Red Death. His vesture was dabbled in _blood_--and his broad brow, with all the features of his face, was besprinkled with the scarlet horror. "Who dares"--he demanded hoarsely of the courtiers who stood near him--"who dares insult us with this blasphemous mockery? Seize him and unmask him--that we may know whom we have to hang, at sunrise, from the battlements!" It was in the blue room where stood the prince, with a group of pale courtiers by his side. At first, as he spoke, there was a slight rushing movement of this group in the direction of the intruder, who, at the moment was also near at hand, and now, with deliberate and stately step, made closer approach to the speaker. But from a certain nameless awe with which the mad assumptions of the mummer had inspired the whole party, there were found none who put forth a hand to seize him; so that, unimpeded, he passed within a yard of the prince's person; and while the vast assembly, as with one impulse, shrank from the centers of the rooms to the walls, he made his way uninterruptedly, but with the same solemn and measured step which had distinguished him from the first, through the blue chamber to the purple--to the purple to the green--through the green to the orange--through this again to the white--and even thence to the violet, ere a decided movement had been made to arrest him. It was then, however, that the Prince Prospero, maddened with rage and the shame of his own momentary cowardice, rushed hurriedly through the six chambers, while none followed him on account of a deadly terror that had seized upon all. He bore aloft a drawn dagger, and had approached, in rapid impetuosity, to within three or four feet of the retreating figure, when the latter, having attained the extremity of the velvet apartment, turned suddenly and confronted his pursuer. There was a sharp cry--and the dagger dropped gleaming upon the sable carpet, upon which most instantly afterward, fell prostrate in death the Prince Prospero. Then summoning the wild courage of despair, a throng of the revellers at once threw themselves into the black apartment, and seizing the mummer whose tall figure stood erect and motionless within the shadow of the ebony clock, gasped in unutterable horror at finding the grave cerements and corpse-like mask, which they handled with so violent a rudeness, untenanted by any tangible form. Add The Masque of the Red Death to your own personal library.